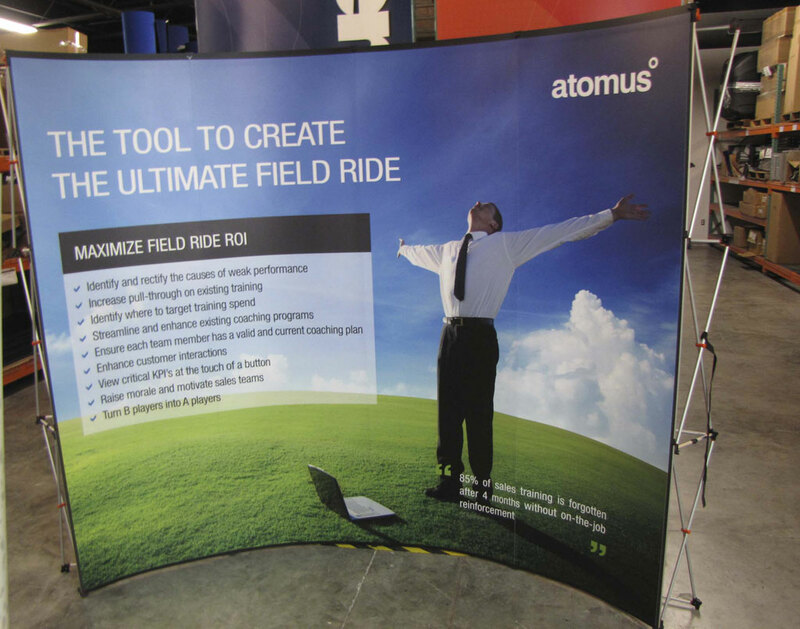 The story begins back in 2014, when Atomus reached out to us looking for a display to present their brand professionally at their upcoming event. Our Director of Sales, John Cornell offered his personal experience to help direct their marketing team toward a few select displays that would fit the presence and budget they had in mind. The first project came to life as a 10ft x 20ft display configuration. 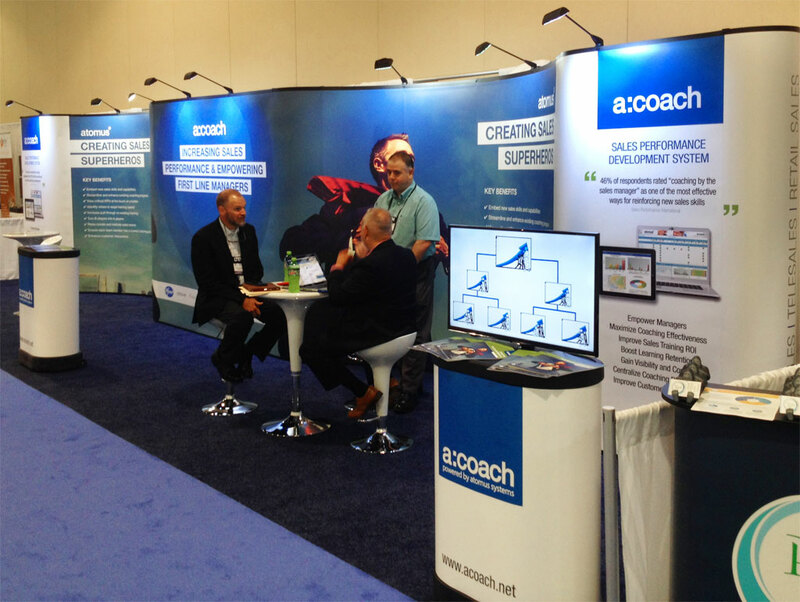 The solution John helped them choose was a 20ft Alcove Pop Up Display with flooring and freestanding Retractable Banners to supplement the booth. Since then, Monster Displays has had the privileged of working with the Atomus team on repeat projects and helping to streamline their trade show logistics. We manage storage between shows and shipping for all their events in the US. 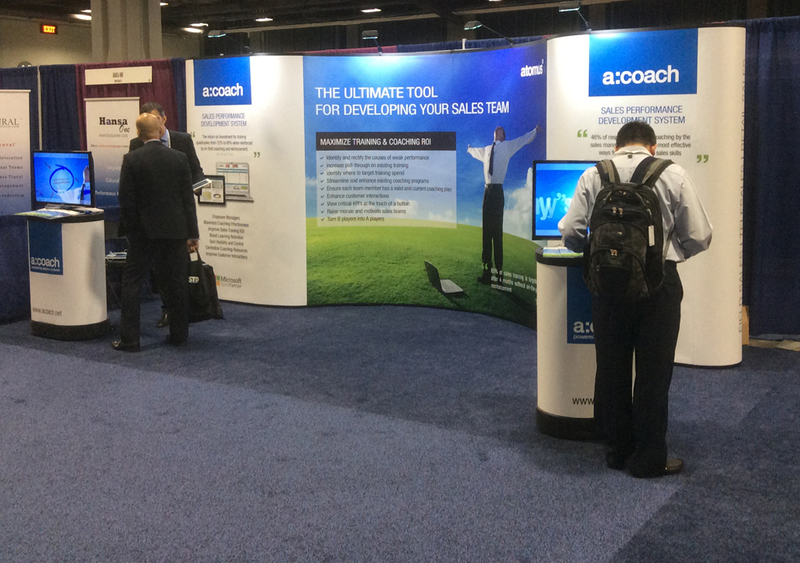 Most recently in 2016, John helped them customize their booth to add to the frame and graphics to create an amazing 10ft x 40ft display. Atomus seeks to harness the power of Cloud computing and make it work for you. Their passion is to understand new technologies as they evolve and be able to adapt them to the world around us to the benefit of their clients. Experience can make all the difference when it comes to finding what you want, and getting it on time. Most companies that come to us are on a tight time table in the weeks leading up to their exhibition. With so much being planned and attention spread across the many elements of a trade show (before and after) it can often make a huge difference to have the shipping and storage handled professionally. For this reason Atomus chooses to store their displays in our temperature controlled headquarters. Each time they have a show we get word and get the booth all set up. Each component of the display is inspected and assembled before being shipped to the venue. Our Project Coordinators make sure the display arrives on time before the event so it can be set up well in advance. It’s our package of peace of mind! 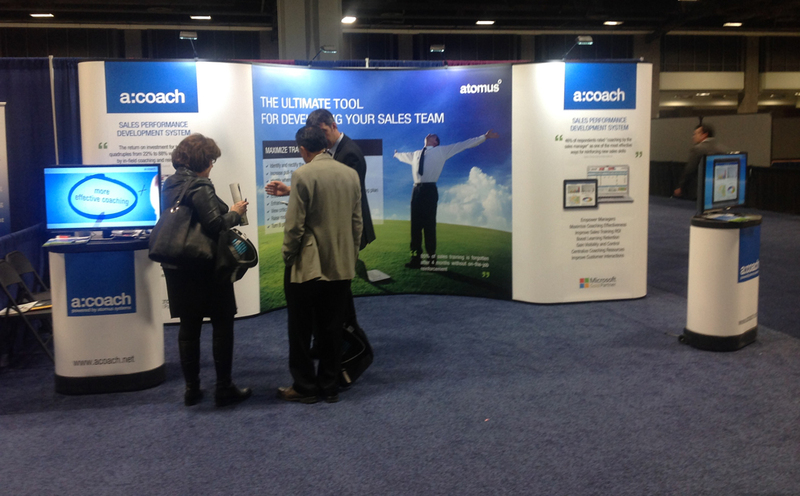 The Atomus booth has grown quite a bit from its original concept, but remains true to its core benefits. The collapsible Aluminum “accordion” frame and rigid laminated HD Inkjet Photomural graphic panels that have been a signature of the booth in all its sizes. 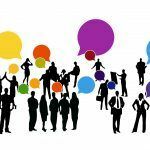 These products are chosen for their great portability and versatile curb appeal that fits into most budgets and is easy to add on to and exchange graphics for each message you want to focus on at a particular venue. 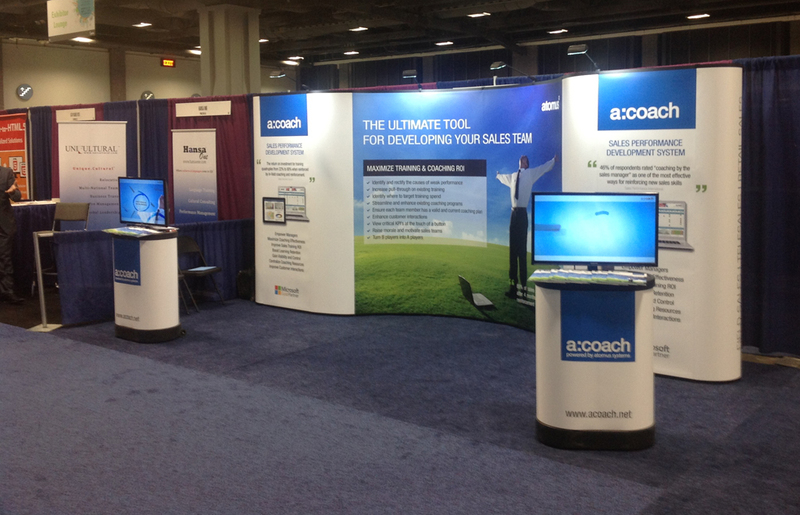 The calm before the storm – the Atomus team with booth set up, looking great! A pair of screens are being used as interactive messaging kiosks, atop hard wheeled cases that feature full color graphic wraps. The HD printing process, paper type and laminate used for the case graphics are the same quality as the accompanying Alcove wall. One of our most popular selling displays of all time: the Photo Mural Pop Up offers excellent brand exposure and informative visibility. Using a sturdy Aluminum “accordion” frame and laminated HD Inkjet panels for protection, this is a go-to exhibitor kit that is surprisingly easy to set up. An example of how utilizing different art can adapt the focus of your marketing between shows. This allows the same frame to be used again and again, maximizing the return on investment. Here we see the original 20ft frame, now showcasing new graphics that seamlessly connect into a 40ft frame, creating a cool double alcove effect. 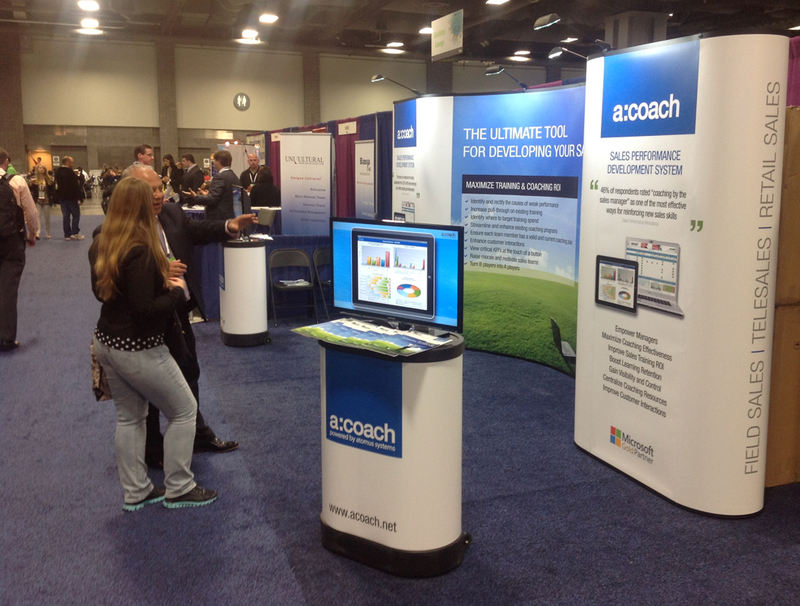 We help take the stress and guess work out of trade show preparation. 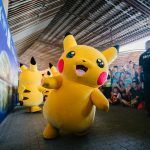 Inspected and repaired or cleaned if necessary and shipped to the venue so your team can worry about capitalizing on leads, rather than whether they’ll have a display behind them. For straight forward shipping, these popup frames and their hard case go together like peanut butter and jelly. Your kit fits snugly into these hard wheeled cases so you travel with the confidence that your precious display will arrive safe and waiting for you. 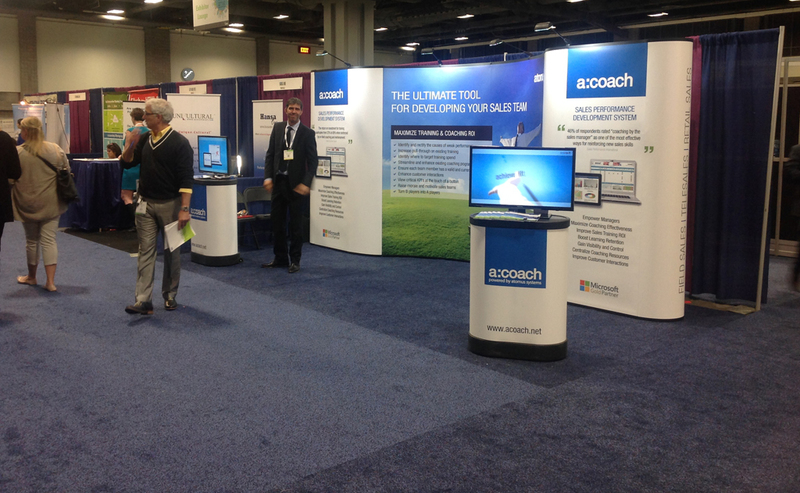 We favor the philosophy that the elements of your booth can serve more than one purpose. 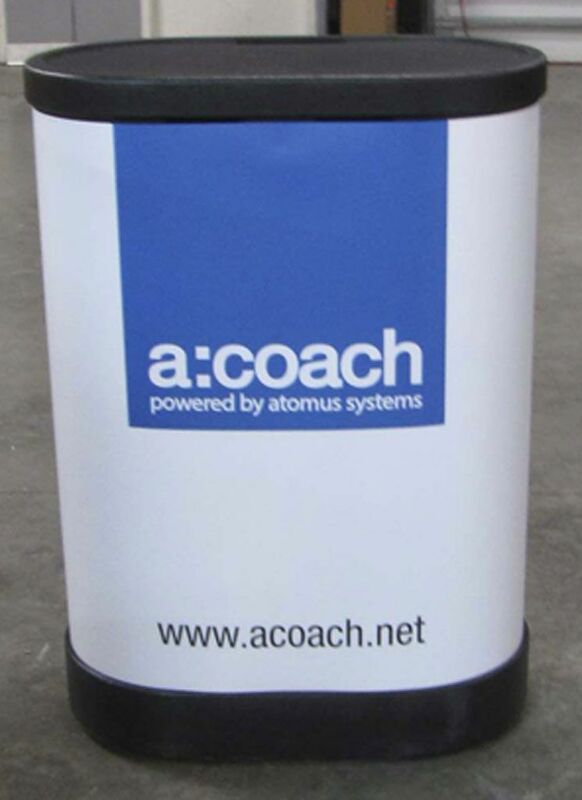 In this case, the EA300 hard wheeled cases that the protect the Atomus booth during shipping, also act as full color graphic podiums to present from, or lay out marketing collateral. 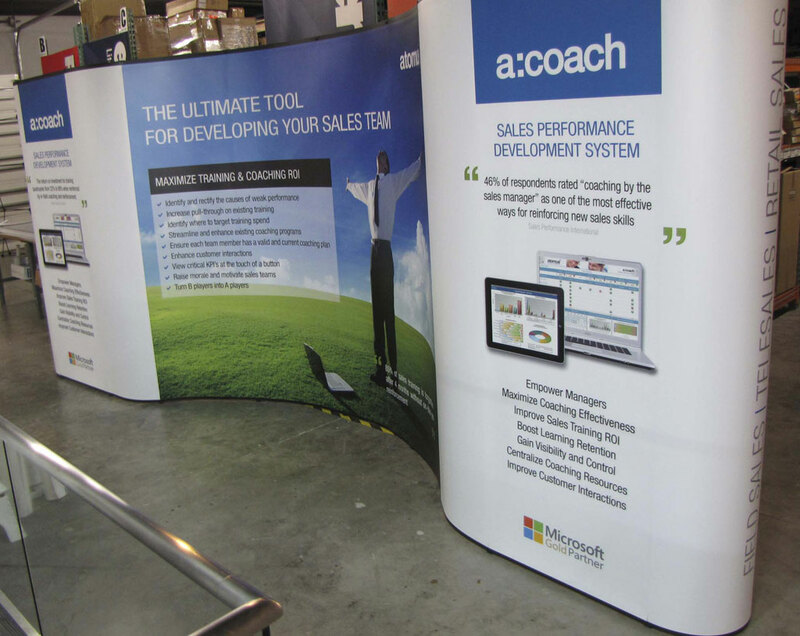 The first of its kind we have seen, the 10ft x 40ft Alcove Pop Up Display was an impressive showstopper. Here we see the advantages of choosing a display that is durable enough to hold up to repeat use between shows. Versatility is also a great advantage, as this original 20ft Alcove Pop Up frame was able to expand into a this 40ft booth as the need and budget grew over time. We hope you enjoyed this inside look at how we support the expanding needs for Atomus brand. From concept to order it has been a fulfilling collaboration between our teams time and again.